" ‘When the dung beetle moves,’ Hosteen Nashibitti had told him, ’know that something has moved it. of this affects you and me, and the flea on the prairie dog and the leaf on the cottonwood’. That had always been the point of the lesson. Interdependency of nature. Every cause has its effect. Every action its reaction. A reason for everything. if one was lucky, to ‘always go in beauty’, to always look for the pattern, and to find it." Note: a Hosteen is a respected title given to an elderly man in a Navajo family. If you share my passion for the American West and you haven’t yet discovered the writing of Tony Hillerman then it’s about time you did. Of the ones I have read The Ghostway or The Fallen Man are good places to start, for like all authors some of his books seem to gell better even than others. Both of these are fascinating, we learn about the Navajo culture which underpins his books featuring reservation cops Joe Leaphorn and Jim Chee. In The Ghostway as a result of going about his everyday work in his typically logical and painstaking fashion, Chee becomes embroiled with some hard nosed, ruthless, city criminals who will literally stop at nothing to protect their bad name. As usual the plot unfolds most believably, in fact it meanders along in a replica of ‘real’ life but never fails to take the reader meandering along pleasantly with it. Some time ago I worked out what, about an author, is important to me: it is the values they express in their writing, and characters which are complex mixtures rather than simplistic heroes or villains. Hillerman, through Chee, is preoccupied with one’s inner harmony and how this is reflected outside oneself in patterns that exist in nature. This comes across in the dilemma Chee has in respecting his traditional values gained during his upbringing while functioning within the framework that is modern life. On a personal level, if Chee is to pursue the love of his life – and the feeling is clearly mutual – he will have to compromise. Can he compromise on those values which are his very essence? The story draws Jim Chee to Los Angeles, where émigrés from his reservation have been drawn into modern life even to the extent of being part of its underbelly. Hillerman hints that the reason for the criminality is that those who do follow the law live a peripheral life which is as financially impoverished as that they have left behind but lacks the support of the traditional social structure. Consequently the city Navajos are far more isolated than those in the geographically more remote reservation. This is certainly the case when Chee visits a law abiding Navajo family in pursuit of a 'lead'. They are living a precarious life in a ramshackle dwelling at the end of an unmade road. 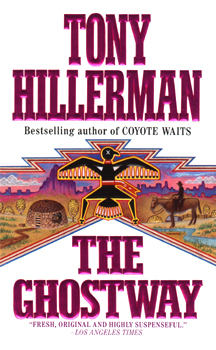 Hillerman’s style is not to preach, however, and we are left to draw this conclusion for ourselves: that modern life has little to offer such people. The comparison with Chee’s dilemma of whether or how to pursue his relationship with Mary is clear. The range of Tony Hillerman’s writing is stunning. At one point I wondered if I was reading the right book because the style of the chapter I was reading stood out as being so different to the rest. A quick check of the spine reassured me – no it wasn’t Elmore Leonard – although the quality of the writing was in the same league, the style was intended to be ‘big city’ compared to the normal less pacy life in Arizona. “A Jim Chee Mystery” on the front of earlier editions of the cover hardly does justice to this fine author, who, more than any other I have read, really captures the spirit of a native American people. While reading The Dancehall of the Dead I was very taken by Tony Hillerman expressing the importance of harmony and patterns in nature, and how everything interrelates, so I wrote it down. I have quoted it at the top of the page. It encapsulates Hillerman’s values and also why I like reading his books so much. If you have a question or comment click here.